Yes, Unruly Things, I want one, too, but alas! 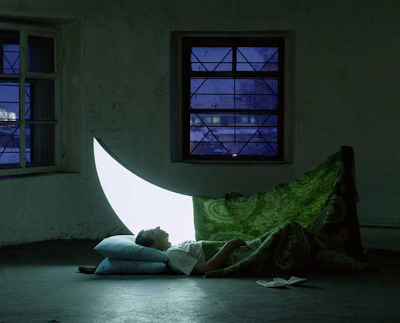 the project titled "Your Personal Moon" for an art show by Russian designers and artists, Leonid Tishkov and Boris Bendikov, was just that--a title--and they are not for sale after all (though what a dream it would be to sleep with the moon!). Blogger In the Labyrinth has posted a few pictures from Tishkov and Bendikov's provocative art exhibit, as well as a link to "The Man Who Owned the Moon," a sweet and endearing story by Celia Bell that I can't wait to read to Samuel. To see more pictures of "Your Personal Moon," search google, or go to artjob.ru. I had a great morning hanging out with Annagrace and Andrea and all of our beautiful children, who always play so wonderfully together. I hope to have more of those mornings, but first, I must pull out the Christmas decorations--December is upon us!